Lean Urbanism is small-scale, incremental community-building that requires fewer resources to incubate and mature. 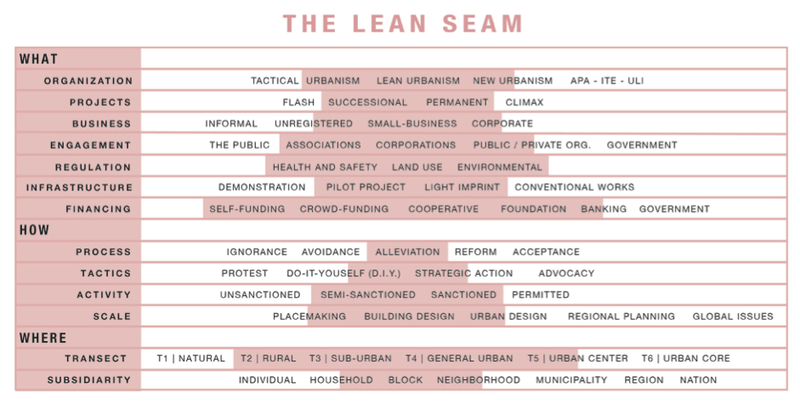 Lean Urbanism is a movement of builders, planners, architects, developers, engineers, activists, nonprofits, municipalities, and entrepreneurs, working to lower the barriers to community-building, to make it easier to start businesses, and to provide more attainable housing and development. We’re Making Small Possible. Lean Urbanism is open-access, allowing more people to participate in the building of their homes, businesses, and communities. The tools will be made freely available to governments and organizations seeking to get things done, to entrepreneurs without the knowhow to overcome hurdles, and to small builders or homeowners who could build well in an economical, low-tech way. The Seven Platforms of the Project for Lean Urbanism are: Lean Building, Lean Development, Lean Business, Lean Green, Lean Governing, Lean Infrastructure, and Lean Learning. Lean Urbanism occupies the emerging seam between the demonstration projects of Tactical Urbanism and the policy-focused agenda of Smart Growth and New Urbanism. The Project includes research, publication, formulation of tools, pilot projects, and projection. The Project for Lean Urbanism is managed by the Center for Applied Transect Studies. The Project has received generous funding from the John S. and James L. Knight Foundation and the Kresge Foundation.